Jon Stewart once said that putting a “We Support the Troops” magnet on your car was literally the least you could do. As a person who didn’t serve, and who frankly knew very few people who served, it was difficult to contemplate what I could offer to show support for the brave men and women who keep us safe. Project RELO is my contribution. It pales in comparison to the service and sacrifice made by those in service, but it is something meaningful. Over 250,000 veterans transition out of the military service each year. Most find employment however there is a chronic issue of veteran underemployment. This is the result of both the military and corporations advising our military members to expect to take steps backwards and start their career over when they complete their service. What results is a massive waste of cultivated talent which goes unused in corporations and creates employment dissatisfaction. Project RELO is a non-profit dedicated to tackling this issue. Project RELO is unique because we focus on the “demand side” of veteran employment. We work with corporate executives to promote the value that veterans can bring to their organizations. We like to say that hiring veterans is more than a social good; it’s good business. We are also unique in how we do this. We pair business executives with military veterans, strap them in to off-road vehicles, and lead them through a series of military-style training exercises where they encounter both scripted and unscripted adversity. In this element the character and leadership of the veterans is on full display. Who wouldn’t want men and women like this on their team? When the founders of Project RELO began this journey, we talked about how we could communicate the uniqueness of our approach and help get the word out about our organization. At the time, I was taking video editing courses on Lynda.com, and I decided to write a LinkedIn InMail to one of the Lynda instructors, Ashley Kennedy . I asked her for advice about how we could go about having a documentary created. I thought that if I had heard anything back at all, it would be something along the lines of a student project. Much to my surprise, she wrote back to me the next day, and one day later, I was on the phone with Ashley promoting our organization. I didn’t know it at the time, but she had already pitched the concept to Lynda of making a series of courses around documentary creation. All she needed was a subject to use as the backdrop of her series of courses. The timing was perfect! In June of 2016, the Lynda/LinkedIn crew of Ashley, Brett, Ryan and Ben showed up in Northern Michigan with equipment in tow. We packed everything into off-road vehicles, and off we went on a Project RELO mission. We did some pre-trip interviews, but other than that, it was a normal Project RELO mission, except everything was filmed. Although we made some accommodations (e.g. having microphones and cameras in our face all the time), nothing was staged. The documentary faithfully captured what Project RELO is all about and how we conduct our missions. On a personal note, I learned a ton about filmmaking (which is one of my hobbies and led me to connect with Ashley). The crew was talented and professional, and like all of RELO alumni, remain my friends. I hope you enjoy the documentary, Veteran’s Work: The Project RELO Story and the Lynda.com series, Learning Documentary Video. Ashley and crew are super-talented and have been a joy to work with. If you’re interested in Project RELO, send me a LinkedIn InMail. It worked for me! 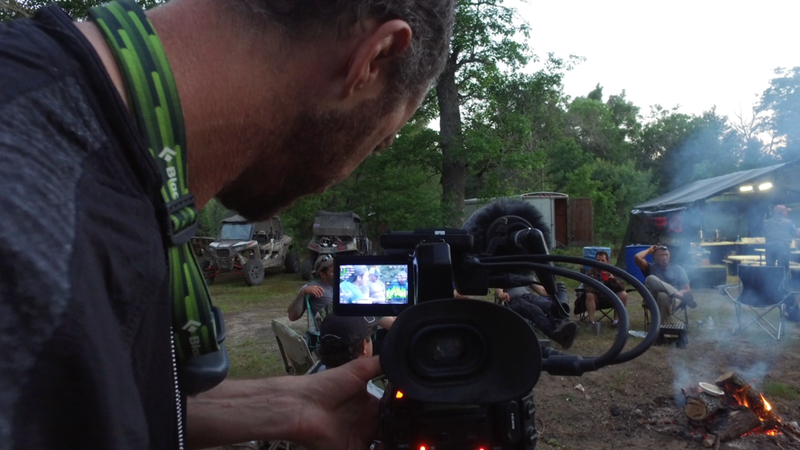 Ashley published an article about her journey with us, "I spent 3 Days Filming Military Veterans and White Collared Business Executives in the Wilderness.."
The finished documentary can be viewed here.